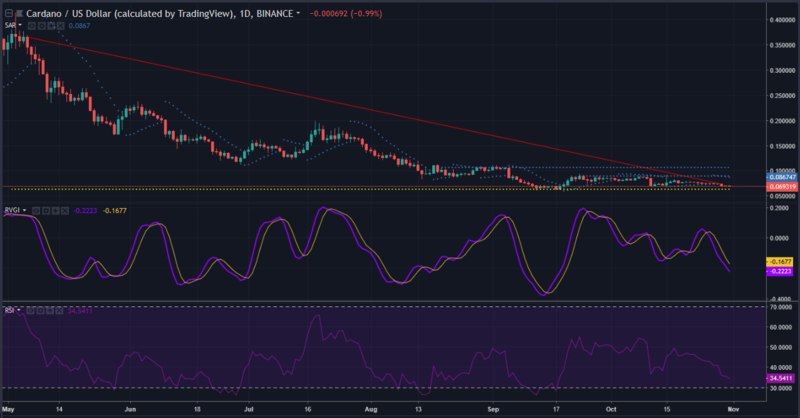 Cardano [ADA] has spent the past few days languishing at its last support level for its drop this year. This bearish situation was exacerbated by the recent flash crash, which pushed the price to a level where it has to recover or fall to a bearish fate. The short-term graph demonstrates a lack of a visible uptrend, with a downtrend being seen from $0.0786 – $0.069. The short-term support for the coin is at $0.069, with resistances at $0.073, $0.075, and $0.077. The MACD is demonstrating a bearish crossover. The Chaikin Money Flow recently turned positive, as seen by the line moving above 0. The long-term outlook does not show any valid uptrend for the coin, as successive bear attacks have driven away investors. A downtrend is seen from May, visible as a price movement from $0.365 – $0.0739. The crucial support is at $0.634, with resistances set at $0.0898 and $0.106. The Relative Vigor Index is demonstrating a bearish crossover, as seen by the line crossing below the signal. The Relative Strength Index is tending towards the oversold zone. The Parabolic SAR is bearish, as seen by the presence of the dots below the candlesticks. The bear seems to be ready for another mauling of Cardano. 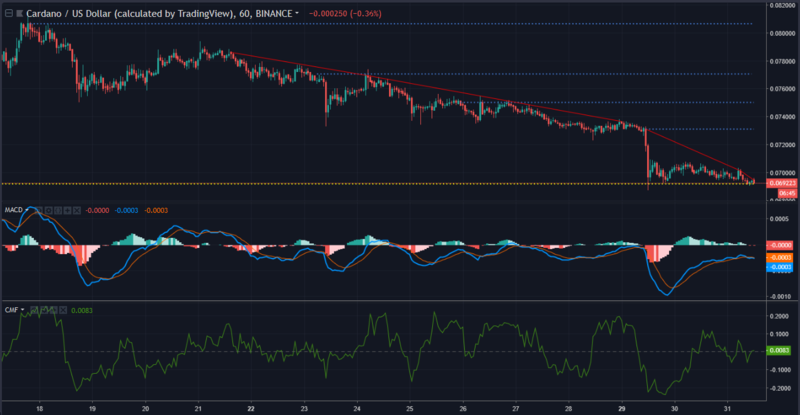 If the coin holds the support at $0.69, it may be possible for the coin to continue its sideways movement.